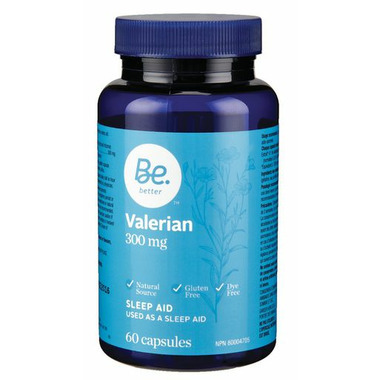 Be Better's Valerian is a natural, gluten free and dye free sleep aid. Dosage: 1–2 capsules daily, half an hour to 1 hour before bedtime, or as recommended by a physician. Ingredients: Valerian 4:1 Extract* (Valeriana officinalis) (root and rhizome) (standardized to 0.8% valerenic acid) --- 300 mg, *Equivalent to 1200 mg dried root and rhizome. Rice starch, gelatin capsule (gelatin, purified water), magnesium stearate, silica. Consult a physician if sleeplessness persists continuously for more than 3 weeks, or if symptoms persist or worsen. Consumption with alcohol, other medicines or natural health products with sedative properties is not recommended.